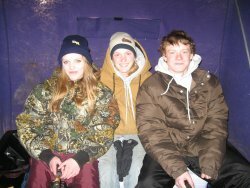 So far the 2008 ice fishing season has been a lot better for my friends than it has for me. Without a snowmobile, my mobility hasn't been the greatest. 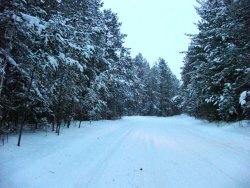 Early snowfall kept ice from improving and slush has been a problem for the four wheeler. On my last fishing trip we were able to get around fairly well on the lake, but on our way out, getting back up the hill required the winch. The good news is that if you pick your lake carefully, there are getting to be more options for folks like me who want to drive out in a truck. The resorts on Big Winnie have gotten a good handle on the plowed roads now and there is some traffic out there. Vehicles have begun to move around a bit on Bowstring too, but there aren't any plowed roads there that I know of. Your best bet is to take it slow and drive out during daylight when you can see the snow drifts. Avoid the deeper ones and you'll be able to get around. My buddy Matt Mattson was on a Lake Trout trip this past Saturday. They traveled by snowmobile and found a lot of slush and even a spot of "almost open" water in the center of the lake. For the most part they got around okay, but he recommends keeping a close watch on the ice thickness whenever you move locations. Trout fishing action in our area has been typical, you'll see some fish on the flasher and get a couple of strikes. The average is to catch a fish, maybe two using simple jigging presentations. I like the 3-1/2 inch white Berkley Power Tubes, Northland's Airplane Jig or a 3/8 ounce feather jig tipped with a shiner. Perch action has been fair on Winnie although the numbers are better than the average size. If you just want to get a meal, you'll be able to do it, but don't count on an all out bite, at least not yet. Some fish are being caught in the 25 to 28 foot depth range out on the main lake and there's been some action back in Tamarack Bay in 12 to 14 feet as well. Crappie reports are getting better on the smaller lakes in the area and that's probably what I'd recommend for someone looking for a little action right now. Like the Perch, the average Crappie size is smaller than usual, but the numbers have been good. Like last fall, there are enough Crappies available so that even daytime fishing has been fairly good. The typical deep-water holes are the best location for now. I talked with a friend who operates a fish house rental on Red Lake and this morning (Tuesday) the wind is blowing and snow drifts are a problem. If you use one of the fish house rental services up there you'll be able to get in and out on plowed roads, but don't count on doing much off road driving. The Crappie bite on Red has been just about non-existent this winter, but there are a few mixed in with the Walleye. Walleye fishing has been okay, some days are better than others though and you could catch 30 today and 10 tomorrow depending on the luck of your timing. Bundling up against the cold weather has been the rule of thumb this winter. Here's how we do it, the kids get the nice warm Otter and I get the spot out on the ice. That's not bad unless they catch all the fish. We just experienced another episode in the continuing story of "Back To Real Winter 2008" as temperatures took a little nose dive back down into the deep freeze. With overnight temperatures into the minus 20 degree range again you would think that our ice conditions should be great. Even with the cold temperatures, the snow has really slowed ice production. We hit one of the smaller lakes on Monday and found about 11 inches of good ice under about 12 to 15 inches of fluffy snow. I was able to take the four wheeler out on to the lake and got around fairly well with it until we were ready to leave. I just got stuck in the deeper snow around the edge of the lake, we got out by disconnecting the Otter, but it looks like you folks with snowmobiles will have the better transportation this season. 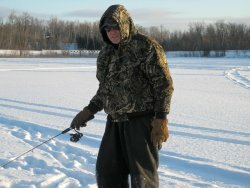 The cold temperatures didn't do much for my fishing either. We had set out to get a few Northern Pike for a meal and after one bite off, the Pike never gave us another look. Then we fell into the oldest trap in the book, we set up the ice house and got it nice and warm. Once the kids were comfortable inside, we never moved again until it was time to go home. So, our New Years meal of Blackened Pike turned out to be meat loaf instead. Better news for me is that the resorters on Winnie are starting to get the road system plowed out and it looks like there will be plenty of places to go just in time for the predicted January thaw due in later this week. Folks are still enjoying some good Walleye action out there in the evenings. Another good sign for those of us who need to drive out onto the lakes, was a pair of headlights I spotted coming across Bowstring Lake on Tuesday evening. There weren't many people out there, but once we see a few tire tracks, things start happening faster. My big game plan for the weekend is still to try and catch a few Pike, so we'll be up and at it early on Saturday, hopefully a great fishing report will follow. If you want to add your 2 cents worth click here to drop us a line. Snow depths closer to average for Minnesota have given snowmobilers something to talk about, but isn't helping travel conditions for ice fisherman.